maemo.org - Planet maemo: category "feed:873bfae2cf41c9a3763e52cc7bcc6edd"
A year and a half ago I published some pictures with the new changes that I was preparing in Butaca, hopefully "to be released soon". Unfortunately, there were some stability issues that I never had the time to investigate and fix properly, so all the new features have been sitting in GitHub for some time already. As time went on, I had less and less time and motivation to do MeeGo development, and eventually I just assumed that only the brave people having Butaca built from upstream would benefit from the latest changes. This year, back in May, I received an email from The Movie Database announcing that the 2.1 API (the one used in Butaca) was reaching its End Of Life in 15th September, a bit less than a month from now. I always thought I would just sit during a weekend, fix these stability changes and replace the API, but the truth is that after I moved to the UK, the kind of "relaxed weekend" needed for that doesn't seem to come too often. In short, I don't plan to update Butaca before this deadline, so it will stop working. So what are your chances as an user? You can use Pop Flix: since they use Rotten Tomatoes, they shouldn't have any issues with deprecated APIs. Regarding your favourite movies and artists, they are saved in a very simple Sqlite database, so you can manually retrieve the values from there. Of course, since it is Open Source, you can go to the repository, fork it and do the changes yourself. I really enjoyed developing Butaca. Although it didn't get to be extremely popular, it achieved more than 10000 downloads, and a really nice 5-star average of 74 reviews. Thanks to everyone who used it and enjoyed it, and specially to those who sent me an email with feedback... and even patches! I left my job at Igalia at the beginning of this month, after a bit more than two years working there. These past two years have been incredible: I was living in Finland for almost the whole 2011, participating in the MeeGo project, and then spent 2012 working from A Coruña's offices, working on WebKit and other technologies. I enjoyed it a lot, got really attached to the people there -- some of them I call friends now --, and grew a lot professionally. Igalia is organized in a flat structure, where we take more responsibilities than just coding, and where the ultimate step is to become a partner. However, I currently have the feeling that I want to focus more on the technical side of things, to gain more expertise, and that would be too complicated without neglecting these other responsibilities -- the kind of responsibilities that take time and energy. Then, being honest with my colleagues, the responsible thing was leaving. I have only started looking for new opportunities since I announced my decision, so things are still a bit unclear. We will be quite probably leaving Spain and heading North: we would like to go to The Netherlands, but we don't discard anything in advance. If your company needs a Software Engineer, chances are I could be of help, so take a look at my profile in LinkedIn, and don't hesitate to ask me for my CV or other details. And, if you're so kind, please pass the word and help me find a new cool place! A couple of weeks ago, we at Igalia got a number of plugins published in the Nokia Store: Enlarge & Shrink, Gallery Tilt Shift plugin, and Facerecognition Reset Plugin. We had them ready for some time already, but still it was very difficult to pass the Nokia Store Quality Assurance: there is a list of valid directories where a Debian package can install its files, and they had missed the ones for Gallery plugins. So, in order to finally get over that problem, my friend and colleague Andrés had to "fight" with the Store QA people quite a bit: don't forget to thank him for this! As you know (and it's already reported), there's currently no way to import an OPML into the Nokia N9 Feed Reader application (see Harmattan Bug #159). From this point on, it should be quite straight forward to import an OPML into the Feed Reader application. You can use a QDomDocument to parse the OPML or use QML's XmlListModel to parse the OPML file. query: subTitle ? "/opml/body/outline[@title='" + titleText + "']/outline": "/opml/body/outline"
Last week, we got Mahjong Solitaire for N9 finally published. This has been a great opportunity to use QML in my daily work at Igalia, instead of using it simply for the occasional hacking, such as Butaca or the XKCD reader. So far, comments in the Nokia Store have been really positive -although some people seem to miss the classic theme from the Mahjongs available back in Maemo. But not only the comments are positive: the application is currently listed in the first position of the Top Free games! After having improved the movie showtimes support and updated the UI so it aligns better with the Swipe UX, this Saturday I submitted Butaca to the Ovi Store. Yesterday (yes, that quickly!) I got a notification that it had been accepted. I'm really satisfied with this release: I use the application myself a lot, and it's great to be able to check which movies are playing on the cinemas and later review their details and the crew's. I've uploaded a screencast to Youtube, displaying how the application works, and -as usual- screenshots are available at my Flickr gallery. You can also review the release details at the project page (where you'll be able to file bugs or get support as well). Download Butaca for free from the Ovi Store! Right now, probably all of you know IMDb. The Internet Movie Database is "the place" you'd go to look up a movie or check the filmography of an actor, writer or director. Some of you will also be familiar with IMDb Android and iOS applications, which allow you to check out that very same information on your mobile device, providing the means to settle any arguments (who directed The Terminator? And Aliens?). 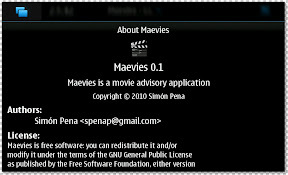 However, IMDb doesn't provide a free API: it provides a big ZIP file that you can download and parse to get that info. Then... -if you don't want to get a commercial license for the API- what are your chances as an Open Source developer willing to get the same functionality? TMDb was started in the fall of 2008 as a side project in order to help serve high resolution posters and fan art for the popular XBMC project. What started as just a simple single page linked with some zip files has morphed into one of the most active user built movie databases on the entire Internet. themoviedb.org is a free and open movie database. It's completely user driven by people like you. TMDb is currently used by millions of people every month and with our powerful API, also used by the world's most popular media centers. And indeed it is a powerful API. 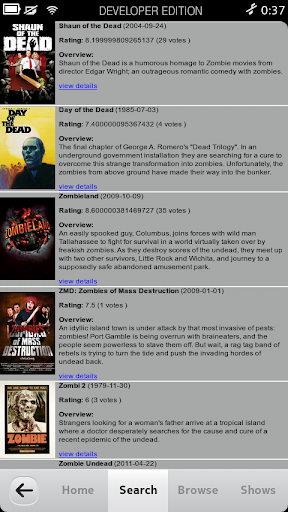 Butaca uses it to provide you with all the movie information you could need :). At this moment, Butaca implements almost all the API exposed by TheMovieDb, so you can search and get information from people and movies and navigate through genres: the only thing you need is an Internet connection. Besides, Butaca allows you to mark the content as favorite so you'd keep it in your home screen as a shortcut. Other available feature in Butaca is movie showtimes. Right now, I couldn't find any world-wide open showtimes API: looks like there are some local ones, which could serve in some countries (or areas inside some countries) but most of these APIs need to be licensed. So what's the solution at the moment? When the user wants to check what's on the theaters around him, the browser is open pointing to Google Movies. 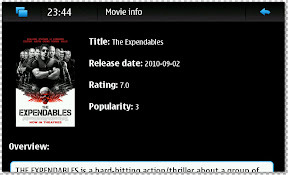 The browser is used also, if you want to check if there are shows for a particular movie. In the future (unless I find some good API), instead of opening the browser, a WebView will be used. This time, some screenshots before heading to bed. You can check out the full set of screenshots at Picasa, the code at Gitorious, and -only for the braves!- a Debian package. Thanks a lot to Tuomas Siipola, who sent me the placeholder icons for persons and movies, and to Felipe Erias, who is guiding me on the UI design. EDIT: Also uploaded the screenshots to Flickr, with descriptions in each view. Three weeks ago, the N9 was announced. Little can be added to what's been written: it's a great achievement, but also a bitter one. Still, I really think that great things can be done on this platform, and that's why I applied to the N950 Devkit Program. My initial idea was to port Maevies from Fremantle to Harmattan, keeping the same architecture. In the week or so that went between the N9 announcement and the filtering of the candidates for the devkit program, I resumed the development on the client side, bringing the ability to save and load favorite movies, as well as other minor UI fixes, and also updated the D-Bus service so that it would compile on HARMATTAN target. When I knew I was selected for the program, I started using PySide (specifically Harmattan Python) to quickly get a working UI which could connect to the D-Bus service... but it turned out that I didn't need it, thanks to the powerful way to deal with XML models inside QML. Today I've uploaded "Butaca" application to gitorious. Still a draft of what I expect it to be, it lets the user search and browse through movies, and get detailed information about them. 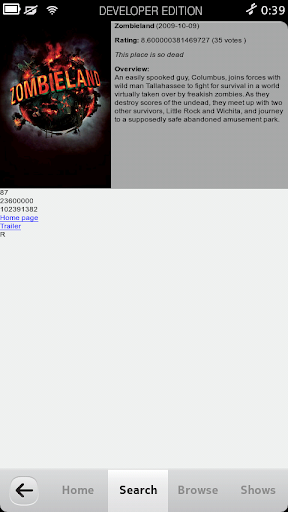 I also created an entry at the MeeGo Wiki at User:Spenap/Butaca. After almost a month without updates, today I've pushed some fixes and improvements to Maevies and butaca-server. The nice news is that Maevies already had users! I haven't promoted this app neither in talk.maemo.org nor in Identica's Maemo group, but several Maemo-related blogs and forums were listing it. It's funny because, as butaca-server's previous version didn't work, those users were happy just with python-webkit pointing to Google Movies . I hope they enjoy the new features they'll find.